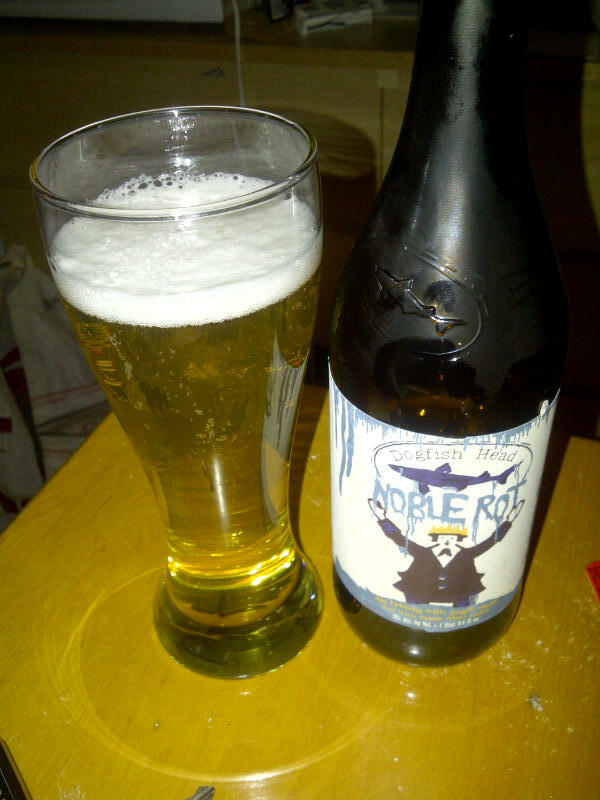 From Milton, Delaware’s Dogfish Head Brewery comes their “Noble Rot” a Saison with a major twist. Grapes are added to this brew and the grapes are infected with a fungus called botrytis which reduces the water in the grapes but increases the sweetness. This process is called Noble Rot. The beer pours a straw yellow that is almost clear with a white head on top. The aroma is of saison yeast, wheat, grapes and white wine. The flavour consists of saison yeast, pepper, wheat, mild sweetness, grapes, citrus, white wine, mild alcohol and a hops finish. The alcohol content of this Saison is 9% and the IBU comes in at 18. The flavour is quite out there, but man is it tasty! Commercial Description: This saison-esque science project gets complexity and fermentable sugars from two unique wine grapes sourced with our friends at Alexandria Nicole Cellars in Prosser, Wash. This entry was posted in Imperial, Saison and tagged @htbev, beer, bitter, bitterness, citrus, delaware, Dogfish Head, grape, grapes, hops, hopy, mild alcohol, mild sweetness, milton, pepper, saison, saison yeast, sweet, sweetness, wheat, white wine. I have only had a few beer by DFH so far so I can not compare to all that many. I did enjoy this brew quite a bit though.